A few weeks ago Arsenal outplayed Chelsea at Stamford Bridge. Chelsea won 2-0. At the end of the season, when the points are tallied, we will not be given any points for that result. Not even a measly little half point. On Saturday, Arsenal stagnated for much of a frustrating 90 minutes. The combination of a very well organized West Ham defense and a brilliant display from Robert Green looked certain to deny Arsenal the three points that were desperately needed. But as the 88th minute tolled, Gael Clichy did something he hadn’t done since March; he provided an assist. In this case, it was a game-winning assist as Alex Song was the bravest player in the box, diving to head home Clichy’s excellent in-swinging delivery. It delivered all three points to the home side on a day when the outcome might have been different. The fact is, there are no asterisks in football. Clichéd as it may sound, football is a results-based business. On Saturday Arsenal got the result and there will be no asterisk at the end of the season denoting that the performance was sub-par or disappointing to the largely somnambulant Emirates crowd. On a day when Manchester United won, and Chelsea were fortunate to grab a late win themselves, only three points would have sufficed. As the table will prove, Arsenal were awarded all three points regardless of the performance, and remain in second place, just five points behind a Chelsea team that is proving itself to be vulnerable after all. That’s really all the match summary that’s required. But that wouldn’t be any fun either, now would it? The beauty of punditry, is that it allows for asterisks and analysis galore. So in the interest of entertainment and perhaps a little self-indulgence, I’ll attempt to consider what might have been the problem with Arsenal’s usually prolific attack on Saturday. First, and this is very important, West Ham deserve huge praise for their effort. While they didn’t provide much in the way of offense themselves, that showed a remarkable discipline defensively and tremendous energy for a team that had played 120 minutes in midweek. There were some bad challenges and the usual dash of terrible refereeing, but overall the West Ham players acquitted themselves admirably. Their defenders were accurate with their tackling, in particular the brilliant Manuel Da Costa. In midfield, Scott Parker made some crucial interventions throughout the match and generally helped break up our passing game. But the biggest plaudits should be reserved for Robert Green who raised his game to the highest level and looked set to frustrate Arsenal until the end. Were it not for Green, we might be picking over the details of a classic Arsenal rout. Arsene Wenger is a genius and questioning his decision-making is always tricky business. It suggests that somehow I am qualified to have an opinion about his decisions that should be taken seriously. Well I’m going to go ahead and question the manager momentarily and I invite you to disregard my comments at your discretion. I think Arsene made his first mistake of the day with the team selection. When we lost at home to West Brom, the team looked jaded from the opening kickoff. Sometimes, after a busy week or a big win, these games against “inferior” opposition can be a let down. That’s even more exaggerated when the game comes in advance of a long trip to the Ukraine. So it might have made sense for Wenger to “freshen” the squad. Bendtner and Theo are just back from injuries, so it remains to be seen how fit they really are, but they should both be chomping at the bit for playing time. Rosicky has probably been among our hardest workers this season. I think selecting any combination of those three for the starting lineup would’ve made sense. Chamakh might have had his poorest performance as an Arsenal player. He still worked hard but you could see that he was lacking sharpness. Arshavin had another performance that’s becoming all too commonplace. Say what you want about his energy level, but it’s the lack of quality in his final ball that’s really worrying at the moment. Replacing either or both of them in the starting lineup might have been a sensible choice. But I certainly didn’t think it made sense to choose Alex Song and Denilson in midfield. Wenger will have known that West Ham intended to play defensively. Surely they would put the burden on us to break them down. Given that knowledge, I’m not sure why we needed two ostensibly defensive oriented midfielders on the pitch. In the past, some of Cesc’s least impressive performances have come when Denilson and Song are both on the pitch. Neither brings the ball forward as effectively or distributes the ball as incisively as Diaby or Wilshere for example. When Cesc gets farther up the pitch, as he did often in this match, there’s no one left in midfield to start an attacking move. Invariably the ball is sent wide and that’s where the attack usually ends. What I don’t understand is why Wenger didn’t use this game as an opportunity to see what Nasri and Cesc could do together in midfield. It would have given him an extra creative player in the middle of the park and made room for Theo to start on the right side of the attack. Eventually we did get to see what that would look like when Denilson was hauled off to make room for Walcott in the 67th minute. And that move nearly bore fruit almost immediately as Theo was very unlucky not to score after being set free by a brilliant Fabregas through ball. Had that combination started the match I’m convinced that we wouldn’t have been biting our nails in the final three minutes. Ultimately, you have to say that Wenger did get the decisions right in the end. He replaced Denilson after a mediocre 67 minutes and then gave Arshavin a rest in favor of Bendtner. I have to admit, the thought of Chamakh and Nik on the pitch at the same time was something I had been hoping to see. Unfortunately, it looked like the Moroccan was a spent force by the time the Dane arrived. But the real question for the manager is why it took him until the 67th minute to make his first change. The game was stagnating and the pattern was all too obvious. West Ham were resolute in their defending and we looked short on ideas about how to break them down. So you have to wonder why Denilson, who added virtually nothing to our goal-scoring effort, was left on until the 67th minute, and Arshavin, who is far from in-form, was allowed to lolly-gag around the pitch until the 80th. The fact is, Arsene Wenger often waits longer than most managers to make his first change. Again, it seems silly to argue with a man of his genius, but I thought he waited too long to make the first change Saturday, and far too long to make his second. We faced a very different challenge at Eastlands than we were confronted with on Saturday. Against City we were pitted against a big, strong team brimming with confidence and title aspirations. We needed a side that could maintain possession and wait for chances to come our way. Against West Ham at the Emirates we knew we would face a side with little endeavor but desperate to fight for a point by keeping us at bay. In matches like the one on Saturday, I think it’s incumbent upon Arsene to unleash his weapons. Let Nasri and Cesc play in midfield together and put the opposition under intense pressure from the start. Frankly, I’ve never been a fan of Denilson. I think he’s a solid player, but I don’t think he’s top quality. I know he’s been fantastic in his past few appearances and his proponents will tell me that he’s completed 113% of his passes this season. (Yes, that’s sarcasm.) I realize that Denilson is a useful squad player and a decent back-up for Alex Song. But his deficiencies are all too obvious when the two are played together. He doesn’t bring the ball forward well and he’s never met a lateral pass he didn’t like. At one point on saturday Cesc tried to play a little give-and-go in midfield with Denilson and the Brazilian just turned and passed the ball harmlessly to Sagna on the flank. That’s a situation where Nasri, or Diaby, or Wilshere, or Ramsey, or Rosicky would be a better choice. Cesc needs another creative, dynamic partner to play with in the midfield. That doesn’t mean it should be someone who shirks their defensive responsibilities, but I don’t think it can be Song or Denilson. What I don’t understand is why Cesc received so much criticism for his performance on Saturday. On another day he might have scored a rather excellent brace and tallied at least one assist when he put Theo through with a slide-rule pass. 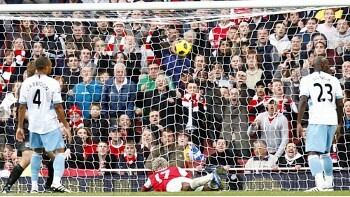 He also set-up Arshavin earlier in the match but the Russian squandered the opportunity. The fact is, Cesc played in a very advanced role on Saturday and with no other midfield player capable of bringing the ball forward effectively, he was largely rendered irrelevant as most of our attacks developed on the wings. If there’s disagreement about Cesc’s contribution, then there can be no argument about Laurent Koscielny. The Frenchman was spectacular in his return to the starting lineup. He’s confident, strong in the tackle, positions himself well, and most importantly, stays cool under pressure. The latter quality is perhaps his greatest contribution to the side. It’s something that Johan Djourou should watch and learn. It’s clear that he and Squillaci are the first choice pairing at the moment, but it will be fascinating to see which of those two keeps the starting job when (if) Thomas Vermaelen returns. Finally, it should be pointed out that I’ve nearly reached the end of this article without mentioning the goal-keeper. That alone is noteworthy. The fact that a solid performance from Fabianski is no longer being treated as miraculous is a tremendous step in the right direction. Just 20 or 30 more appearances like this and I think we’ll all feel much better about our goal-keeping situation. I fully expect Manuel Almunia to have a few more set-backs on his road to recovering from whatever ails him. After the match, Arsene Wenger was complimentary about his team as you’d expect but there were two quotes from the manager that I found amusing and interesting. First, when asked about Alex Song scoring the game-winning goal, Wenger had this to say, “He has got the taste to go forward, even if I think a little too much sometimes for a holding midfielder!” You’re not alone in thinking that monsieur. But here’s the question: if Arsene is the manager, and he doesn’t like Song getting so far forward, why is Song still doing it? Is it insubordination, or is Wenger failing to get the point across? You would think that it’s an easy problem to fix. Either way, I found this quote at first hilarious, and then somewhat worrying. However, Song has scored three goals in three games and it’s going to be hard to stop him going forward with that kind of record. The second quote that I found amusing was on the topic of clean sheets. Regarding the third consecutive match in which Arsenal have kept the opponents off the score-sheet, the manager said, “That’s new, that’s new for me! A day where I don’t have to look on the television slow motion to see why we conceded a goal does not happen often so I am very happy with that.” You’re not alone Arsene. You’re definitely not alone. So that about sums it up. It’s three crucial points that came late but ultimately were well deserved. It’s worrying to hear that Cesc may be suffering from a recurrence of his hamstring problem but I think it’s a positive sign that he was able to finish the game. I’m guessing that he’ll be rested on Wednesday with Wilshere back and our group position looking good. Since this was our last game in October, we all know what comes next. That’s right; November. And we all know that November is the worst sort of month to be an Arsenal supporter. If we’re going to challenge for trophies, exorcising our November demons would be a great step in the right direction.